Powers/Abilities: The Plex Supreme Intelligence system was standard on all Kree diplomatic vessels of Noh-Varr's home reality. It was a programmable piezoplasm housing the accumulated wisdombase of the entire Kree race, which it could access via multiple personality complex interfaces (sometimes different personality complexes could disagree if activated simultaneously). It was dedicated to the protection and survival of the Kree. 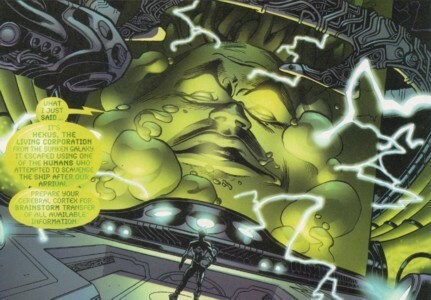 It used the Omniwave to stay in contact with Noh-Varr and was able to use it to control humans telepathically by creating an Omniwave bubble. Linked to the Marvel's computers it was able to use and control all of the ships internal sensors, weaponry and other systems. (Marvel Boy II#6 (fb) ) - In the fourth aeon of gene mastery the Supreme Intelligence ruled the Kree Empire. Plex Intelligences derived from the Supreme Intelligence were installed on all dimension-schooners, which traveled through many realities to bring the way of the Kree to everyone. (Marvel Boy II#5 (fb) - BTS) - As a standard installation on board of the dimension-schooner Marvel, Plex became witness to all the 18th Kree Diplomatic Gestalt's adventures. (Marvel Boy II#1-3 (fb) - BTS, #5 (fb) ) - Plex witnessed the many adventures of the 18th Kree Diplomatic Gestalt. (Marvel Boy II#1) - When it seemed like the Marvel would finally return to its own dimension, Noh-Varr was in the tank with Plex. A short time later the Marvel was shot down to Earth with Plex, Noh-Varr and the rest of the crew by the Midas Foundation. As soon as the instant Plex Intelligence was reinstalled it activated the ship's defensive systems, which leeched all available energy from the natives and their machines. Plex used this energy to telephase the whole ship to New York City's sewer system before Midas' men could scavenge the ship further. Five of Midas' men were killed during this. After Noh-Varr had escaped the Midas Corporation HQ, Plex contacted him and told him home in on his transmission. Noh-Varr flew to New York City where he was soon reunited with Plex on their ship beneath the town. Plex then explained to Noh-Varr the technological status of this Earth while using New York's energy to repair the ship. He sensed that Noh-Varr was very angry and suggested to him to lie low, but Noh-Varr wanted revenge for the death of his friends and muted Plex. (Marvel Boy II#2) - Plex stayed in contact with Noh-Varr while he unleashed his rage on NYC. He kept people out of harms way by hypnotizing them with Omniwaves. The radius of the Omniwave bubble was ten miles wide, which Noh-Varr used to write a message in big flaming letters into NYC. Plex informed him that he could maintain the field for only another 15 minutes when three superpowered humans entered the bubble. Plex told Noh-Varr everything abnormal he could sense about these men and suggested to Noh-Varr to flee. Noh-Varr, who had taken a "Pocket Battlefield" from the archive, needed Plex to explain him how it worked. When Noh-Varr was overpowered by one of the Bannermen, Plex sent bystanders into the "Pocket Battlefield" to surround the Bannerman, who was trained not to attack civilians and was beaten up by them when he reverted to his normal form. Plex told Noh-Varr that no more threats were around and Noh-Varr finished his message. (Marvel Boy II#3) - Plex alerted Noh-Varr that Hexus had escaped during the raid of the ship by Midas' men. Plex explained to Noh-Varr what Hexus was before asking Noh-Varr to save Earth from it because Noh-Varr was responsible according to Kree-Vann Directive Big Red. Plex and Noh-Varr searched for Hexus, which had become known on Earth as Brand Hex. It was already marking Earth when they found it. Noh-Varr attacked the Brand Hex HQ. Noh-Varr connected Plex with Brand Hex's corporate database and distracted Hexus while Plex hacked the database and sent all of Brand Hex's corporate secrets to rival corporations. The next day Brand Hex was history and Plex informed Noh-Varr about the Living Corporation's demise, but Noh-Varr didn't answer because something was interfering with the Omniwave reception. (Marvel Boy II#4) - Noh-Varr reestablished contact with Plex, who was surprised that Noh-Varr was alive and immediately told him that he was surrounded by hostile forces as the entire city block was a trap. When Oubliette, the daughter of Midas, fled with Noh-Varr into the sewers, Plex contacted Noh-Varr again. Oubliette heard Plex's voice over her watch-radio. Plex explained to her what it was and she informed Plex that Noh-Varr was injured and needed help. (Marvel Boy II#5) - With Plex's help Oubliette was able to bring Noh-Varr back to the Marvel. There Plex took care of Noh-Varr to genetically reconstruct him. When reconstruction was completed Plex informed Noh-Varr that Oubliette was let into the ship because she had brought Noh-Varr back to the ship. Plex tried to talk some sense into Noh-Varr and Oubliette when they threatened each other with guns. A few more explanations about its own nature and then Noh-Varr let Plex open the ship's memory to show Oubliette the history and the end of the crew by the hands of Oubliette's father. Plex suddenly detected a Skrull chimera signal in Oubliette's mask, but it was already too late. Midas had arrived with armed forces and SHIELD agents. They destroyed the tank with the Plex Intelligence, but didn't catch Noh-Varr and Oubliette. (Marvel Boy II#6) - Plex kept sending messages to the present SHIELD psi-operatives until they bled from their noses. Plex then activated its emergency back-up and accessed the database for Kree murderers. It then activated the Helicoptera to kill everything on board that was not Kree. It was still trying to reinstall its base survival routines when Dr. Midas returned fully transformed to pick it up and invade its molecular memory. Noh-Varr ordered Plex to self-destruct, but it couldn't because Midas had enslaved it. Noh-Varr shot Midas to free Plex from his grip. Plex was helpless while Noh-Varr and Oubliette defeated Midas. SHIELD caught Noh-Varr and brought Plex to their space station where it tried to remember what it was. SHIELD kept experimenting on Plex, but most of Plex's knowledge was destroyed and it didn't work very well anymore. (Civil War: Young Avengers & Runaways#2 (fb) - BTS) - Plex was killed, but because Noh-Varr seemed lost without him the Cube's Warden began to mimic Plex's voice and gained full control over Noh-Varr. Comments: Created by Grant Morrison & J.G. Jones. 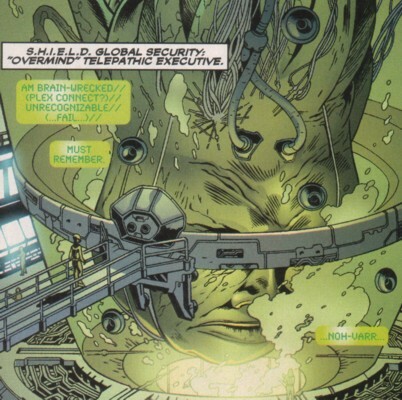 IMO Plex should've a numbered designation because it was one of a series of Plex Intelligences derived from the Supreme Intelligence, but there was no designation given in the comics. This Plex Intelligence had much to tell after all the years it was away from its home reality. I'm sure the other Plex Intelligences and their master system the Supreme Intelligence would've been surprised by everything it had witnessed. The name Rogue Fantastic comes from the Marvel Knights/Marvel Boy Genesis Edition#1. He is the guy with the white temples seen in Marvel Boy II#1 and #5. The Helicoptera were razor sharp little robots. Reprogrammed for defensive measures they were absolutely lethal as they could fly right through enemies. Their original purpose is unknown. Maybe they were used for repairs or reconnaissance. (Marvel Boy II#5) - Exterminatrix was impressed by the Helicoptera while Noh-Varr told her how dangerous they were. (Marvel Boy II#6) - Plex used the Helicoptera to kill all soldiers and SHIELD operatives. They were useless against the mutated Dr. Midas.